I wish there were 10 books written about my ancestors! Although there aren't, I do have a good number of books at home and I use libraries a great deal, especially the British Columbia Genealogical Society's Walter Draycott Library. Here are a few I rely on or re-read often. I'm cheating a bit here with the #10 for my list; I'd have another 10 I'd recommend, especially for Canada or British Columbia. Quite a few of these are Canadian books - but only four cover Canadian topics - and some of those IRWINS did live in the United States. Since I’m a timeline person, a book like this is always both interesting and useful. A good starter guide to Canadian contacts for fraternal societies, professional associations, medical and legal records. 8. About Genealogical Standards of Evidence, A Guide For Genealogists by Brenda Dougall Merriman (Toronto, Ontario: The Ontario Genealogical Society, 2008 3rd Edition) I'm still using an older edition, but I'm ordering this new one. I find these last three books always useful re-reads. Bet this last one is on many lists. 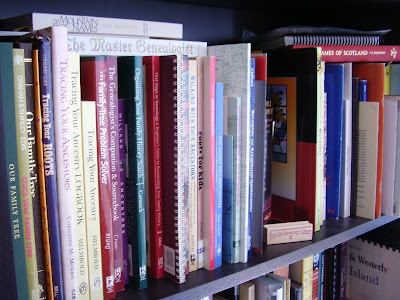 Now here is my idea for another topic - Do you read genealogy magazines and journals? If so, which ones? I'm reading the September/October Everton's Genealogical Helper. Everton's is one I'd be hard pressed to give up and now there's an on-line version of it too. What are your favourites? I like your idea about the periodicals and quarterlies meme. I devour each issue of the NGS Quarterlies. Another that I subscribe to and simply drool over is TAG - The American Genealogist. And then there is the quarterly that the North Carolina Genealogical Society publishes. I could go on and on telling you how many of these I subscribe to but I will save it because you are going ahead with your great meme idea, right? I'm so proud and honoured that my book made it into the top 10. I hope it helps people to think outside the basic church/vital statistics/census records mindset when searching for information.